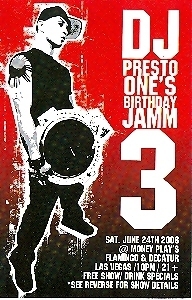 This a promo card for DJ Presto One's Birthday Jamm on Saturday, June 24th, 2006, at Money Play's, Las Vegas, Nevada. Card is about 5 1/2 X 8 1/2 inches, in mint condition. Buyer is responsible for 1.00 postage within the USA and Canada. Please send email if you need additional details on the card. Thank you for checking us out!